Have you ever used one of those clunky hair clips? 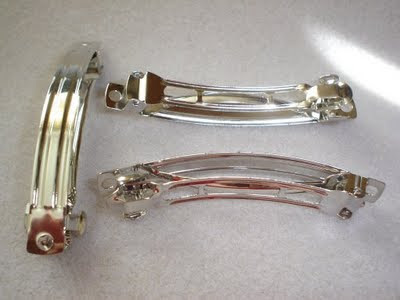 I know I have devoted quite a few minutes of my life standing in front of the mirror trying to get the clip to snap shut only to have it unhook and fall to the floor once I removed my hands. Or some hair clips are notorious for ripping out hair. Well enough is enough, today I introduce you to you the Zannclip. The Zannclip is a smooth spiral coil that securely holds your hair in a variety of styles. I decided to get the 24K gold plated clip for $19.00 and the black one for $11.00. I decided to get both clips in the large size which is 3 3/4" long but medium and extra large is also available. I also used a discount code when I placed my order so I saved 15%. I have to tell you that the gold one is really smooth and neither one has snagged my hair. While the gold clip is very smooth, the black one has a little texture to it and the coating is a bit more matte when compared to the gold. You get your money back(including shipping) if this little baby breaks on you so that's always a good thing in my book. In fact it's such a sturdy clip that I don't know how one would break it. The Zannclip people say that when you take the clip out you won't have that big dent in your hair that people commonly get when they use regular snap clips. I have to tell you after wearing it for hours, my hair was dent free. You may see a tiny impression but it is not even close to what you would get with other clips. Some of you may say, well I already have a claw clip so no need for the Zannclip. Ok well just try putting your head on a head rest while you have that claw in your hair...YIKES not a good feeling. The Zannclip lets you rest your head comfortably....hey I'm a gal who likes to be comfy..lol. Anyway that's my zannclip review and I like the clips. However, I won't buy it again because the two I have will hopefully never break and if it does they give me a new one on the house. What hair accessories are you rocking? You already know where I'm going with this....The REAl Housewives of Atlanta. Lisa was her usual trouble making self. Kim's wig is still bad in my opinion but it has a bit more gloss to it this season. Oh and note to Kimmy people from various backgrounds have worn wigs, falls, hair pieces or whatever you want to call them for YEARSSSS, it's not just "catching on in the Caucasian communities" so please stop..lol. Nene was as loud as ever. We learned that Kandi's daughter is working with a brighter light bulb than her mommy. Sheree in my opinion has been HUMBLED by the lifestyle DOWNGRADE. Don't get me wrong I think her new house looks nice too but I have a feeling she was taken down a notch or two when she was forced to leave her mansion. Her ex-hubby should be ashamed of himself for not paying child support...that man is loaded, not only from his football career but doesn't he also own thriving record studios that famous musicians use? Pay your child support buddy. Yes, we all saw the show and I already know how many of you feel about the first episode of the new season so I wanted to switch gears just a little. Did anyone watch Sheree on the post show? It was this weird little show hosted by the guy who normally hosts the reunion shows. Anyway the party planner who was 100% unprofessional, was on the phone and said Sheree was rude etc., if she was, we certainly didn't see any indication of that on the show. Normally I am not a Sheree supporter but gee whiz was I on her side over that escapade. The party planner did apologize for the nasty comment he made about her mother. He also tried to stress that the party was being thrown for her for FREE. I guess that was his big selling point to make Sheree look bad, but he is still a clown in my eyes. Sheree claims he offered to throw the party free of charge, she at no time asked for the freebie. Bethenny said she loved the RHOA the most because it is the best show in the franchise....ok nice comment...then she said..it was straight COMPTON....huh Bethenny??? Compton, really? She then said some other low brow comments which in my opinion was really saying oooh you trashy ladies are hilarious. Didn't like Bethenny's comments one bit! Anyone with me on this one? Can you believe that we are already at the end of July? It feels like this year just began yesterday but in reality more than half of the year has ended. For most of us that's not such a big deal, but the pressure may be on for Neenah. Remember the woman who has been all over the net and tv since January proclaiming her desire to find her husband to be in 52 weeks? She even created her own website which she named 52 weeks to find him cute right? Well I hate to be the bearer of bad news but as the clock ticks on, Neenah has yet to find a suitable mate, dare I say it looks like she's just struggling to find a DATE. I must admit she has put forth great effort, she isn't sitting at home waiting for Mr. Wonderful to fall from the sky. On her site you can watch videos of Neenah trying to find her future husband in a bookstore, bowling alley and bar. Next she will attend a church outing on her quest to find love. She has interviewed happily married couples to get advice but not much has seemed to work for her. What gives? Why is this intelligent, lovely woman single? I have my ideas but I want to hear from you :-). ***EDITED to include this article posted on the Essence site. Nilotica is a special shea butter not commonly found in your local stores. So does it deliver? Is it worth the extra money? Check out my video. NYC get a hold of yourselves because this offer just may blow you away. From July 22nd through July 30th, The Aveda Institute New York (233 Spring Street between 6th Avenue and Varick) is offering complimentary mini-facials featuring Aveda’s botanically-derived skincare. The customized, spa-quality treatments last 30 blissful minutes­and are performed by senior Aveda Institute students under the guidance of experienced instructors. Following each service, students will recommend a regimen of Aveda products best suited for the guest’s skin. What’s more, if you purchase $50 in Aveda products, you’ll receive $20 off of any Institute service. Schedule your appointment now, as space is limited. Appointments and information: 212.807.1492, ext. 4. Although I say it on the video I just wanted to say that I hope you had a chance to catch Dr. Oz on the Oprah show. He always gives out such wonderful information. For great skin he said you need to take in vitamins A, C and E because they will give you your main antioxidants. If you recall, a while back I raved about my turbo C powder by Philosophy. The turbo boost is pure vitamin C which you mix in with your moisturizer. Dr. oz also said that when you purchase products with vitamin A you may see the words retin a or retinol, that's what you need to look for. You also need to take in omega 3 and 6 fatty acids. Today in the video I reviewed the Oyin Honey Hemp conditioner, and I spoke about my silk amino acids and honeyquat. I also discussed Dr. Oz's hair test. As you may recall in a recent post I purchased a natural deodorant by LaVanila, which turned out to be quite the stinker. I located my receipt and returned the $18 deodorant which made it so much easier to pick up the $19 Laura Mercer eyeliner that I had my eye on. I only had to pay the difference which turned out to be $1.08. This particular eyeliner caught my eye because the color is black violet. So as you may have guessed it is black but with a nice violet undertone. This color was going to be my introduction to the world of non black eyeliners. I think one day I will actually pick up a blue liner but baby steps, baby steps. In the picture on the right the top line (the line closest to my bracelet) is a a black eyeliner called engraved and it's by MAC. The liner at the bottom is the Laura Mercer black violet liner. I wanted the colors side by side so that you could see that it looks..... well just dark. I guess it didn't have as much violet in it as I thought...whomp whomp. ( I love the word whomp..lol ) Below you will see the black violet on my eyes but I never go heavy with eyeliner so this may be a pointless picture. **EDIT** I forgot to mention that when I went to wash both eyeliners off of my arm, the Laura Mercer came off so easily with a little soap and water. However, the MAC eyeliner required a little more scrubbing power. If you are a constant eye rubber you may want to go with the MAC eyeliner which will stay put longer. As you know, during the month of June I was on a little clean sweep/financial challenge. Being on that challenge helped me to better discern between my wants and needs, which meant I was not frequenting stores for no reason at all as I had in the past. Earlier in the week I stepped into a beauty supply store because I needed a new comb and let me tell you about my reception. I was greeted with a hug from one of the employees and he said "Where have you been? I haven't seen you in about 30 days" I kid you not the man had my time frame all calculated in his head...maybe a drop in store profits led him to remember that I had been missing for a while...lol. After telling him that all was well in my world, I picked up my comb but geesh it made me feel like I must have been living in that store for him to acknowledge my absence. Last night while watching the disaster that is the Wendy Williams show...cancellation of series coming in 5, 4, 3..
Ok anyway I saw Nene from The Real Housewives of Atlanta. She was there to promote the new season which will be starting this summer. When they showed a clip of the new season I saw Sheree (the one who pretends to be so classy and she always says FABLESS as opposed to fabulous) walking with NeNe and she intentionally pulled on Kim's hair. Kim seemed to storm off down the street in a huff while NeNe called out for Kim to return. This is probably showing that there will be a drama filled season but honestly if they will get physical I am soooooo not interested. I say that because ummmm they are adults and that behavior is so 2nd grade. I hope this isn't some feeble attempt to look more low grade than the Housewives of New Jersey (the train wrecks as I like to call them). Pull it together ladies, while your witty banter may give you ratings, physical attacks will certainly leave a bad taste in the mouths of their viewers or just mine. Do you watch "So You Think You Can Dance? If so then last night, maybe you were as impressed as I was by Travis' (former SYTYCD winner) choreography. I just wanted you to know the link to the Chagrin Valley soaps that I spoke about this week. If you just type in Chagrin valley soap, you get some weird company but the company I purchased from is Chagrin Valley Soap and Craft. My last order of soaps will come from Zaja naturals, once I receive them I will show them to the world and let you know which soaps I love the most. How have you all been this week? Anything interesting going on in the world of beauty? Below is a review of the all natural handmade soaps that I purchased from Chagrin Valley. Could this be the ULTIMATE Soap company??? If you can't or don't want to watch the video- first of all shame on you..lol and secondly I like these soaps. In general if you were to get a Chagrin sized bar soap from Lush, you would be paying so much more money, so Chagrin is your budget friendly soap company. I also love that you can get sample bar soaps for as little as $2.50. I would purchase from this company again without hesitation, the shipping was fast and the soaps are delightful. Initially I thought the soaps didn't smell so fragrant but it was really the Rhassoul soap stinking up the joint. ( It really doesn't stink, it just has a minty scent). Once I separated the soaps I could appreciate the less minty scents of the other soaps. I love having carrot juice, goat's milk and chocolate (for it's antioxidant powers) as ingredients in my natural soaps. 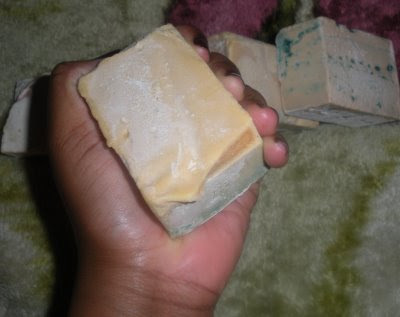 I should also note that a part of the reason why the soaps were not more powerfully scented is because additional fragrances were not added to the soaps I ordered, just pure natural soaps. For now, this is my staple soap company, the only way that I would stray would be if another store emerged with soaps featuring scents that are to die for. Other than that, I am very happy with Chagrin Valley Soaps, thanks to everyone for the recommendation. I missed the majority of the Tina and Toya show, so how was it? I saw the part where TI wanted Tiny to hang with him instead of going out with the ladies. Family night at home is very important so I understand, but I'm just wondering if that "stay at home" rule applies to TI.....I think NOT..lol. What did I miss last night? If you have an IPhone you need, I mean NEED to download the version 3.0 updates because we can finally copy and paste, as well as text in landscape...yayyayaya so many new features. Features that should have appeared on the first iphone but whatever I'm not complaining. 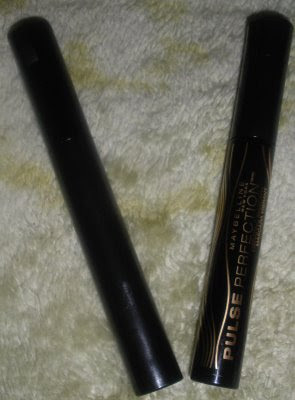 For those who can not view the video the Almay Pure Blends mascara is 97.5% natural. It's supposed to give you volume but I found that it gave me more length than volume, and I'm fine with that! It contains, wax, honey and many floral extracts. However, it flakes like you wouldn't believe. It cost me $6.75 at CVS. Unfortunately, I won't be able to blog today but you know I had to leave you with something right? 1) Congrats to blogger Tam whose aunt was featured in the recent Ebony article :-) And check out her fabulous blog Get it Girl. 2)We have a new blogger on the block and she is serving up posts you may enjoy. Check her out at All Things Fantab where she writes about all things Fatabulous. 3)Fab E over at kabuki Queen talks about everything under the sun. Essence mag posted some nice photos. My post today is really an update on the fat smash diet. Ingredients-Purified Water, Saponified Coconut and Safflower Oils, Aloe Vera and Fragrance and/or Essential Oil. Wonderful right? Now to top things off you can order your soap in any of the scents that you may love from Karen's famous hair milk and conditioners. The issue that I faced is that the soaps have a scent that overpowers the scent you ordered. I don't know if it's all the oils in the soap or other factors that come into play when you make soaps but let's just say my coco lime didn't smell like coco lime. You get the slightest whiff of the scent you ordered and the rest smells like some unidentifiable oil. However, if you are not too concerned with the scent have no fear because this product lathers really well and it leaves your skin feeling really soft. For a mere $6.00 price tag, I think it was soap worth trying so I am not disappointed that I made this purchase. And I should note that the size of the soap is bigger than your standard soap size bar from Lush and it's less expensive! The bar is also long lasting so you don't have to worry about it melting away after a few showers. Final Decision- It just so happens that I am a fanatic when it comes to scents so the fact that the soaps are not as strongly scented as her hair milk and conditioners is a factor for me. Again I must say that the way it makes my skin feel is a huge selling point so I am on the fence at the moment. I will try out soaps from other companies until I find my perfect natural soap but at this moment I don't think I will repurchase these soaps. Sidenote- When I read the reviewes on the KBB site (there were two comments at the time) one person said that the soap has helped with her ezcema so that's great! LaVanila produces a line of natural deodorants for $18.00. I give more details on the video to follow but this is not a natural deodorant that I would buy again. I had zero coverage so this was pretty much useless to me. However, unlike the Lush aromacream deodorant this product did not make my skin itch so that's a good thing. This product must go into the "SKIP IT" files. The wand at the top is the Maybelline mascara and you can see that it is fatter than the lancome mascara wand. Here is a close up shot of the wands. 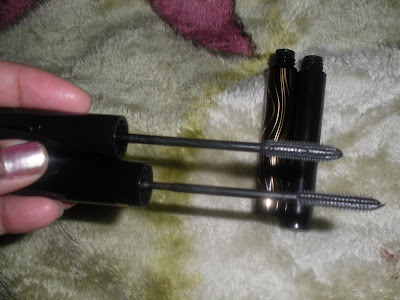 Although I like oscillating mascaras I only have room for one, so I have to make these mascaras battle it out. 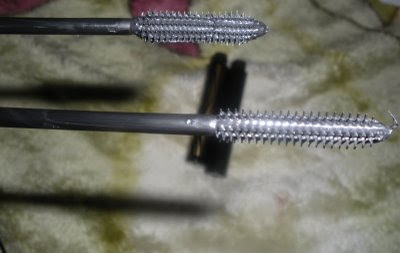 Which eye has the $14.00 oscillating Maybelline mascara, and which eye is showcasing the $34.00 Lancome Oscillating mascara ? Need a closer look? Check out my lashes from the side...which is which? Thanks to everyone who follows this blog and to my YouTube subscribers. THANKS SO MUCH!! This is the video I wanted to post yesterday! I had a video post planned for today but I am experiencing some technical difficulties, so I will post it tomorrow. Every once in a while I can be judgmental, hey it happens so sue me. I just thought I had that Tiny and Toya show pegged. Before last night, you could not have told me that I didn't know how each scene of that show would play out. Filled with righteous indignation I tuned in, ready to scoff at all of the stereotypes I expected to see as I waved my finger and declared that their behavior is what's wrong with some people in the world. However, I saw two women struggling to find themselves and to create identifies for themselves that would not be tied inevitably to the men in their lives. You really did see a different side of Tiny especially when you watched her connect with her parents, specifically her father who has Alzheimers. You also learn that her famous mate, TI, would prefer that she not work at all. This is actually an issue that so many women face, will they live out their wildest aspirations or leave that behind to support their families? Can you successfully manage a career while keeping your private life in tact? While providing your mate and children with a steady foundation upon which to build their dreams, the woman's dreams seem to quickly fade into the background. I actually think a portion of Tiny's heart is trapped between the love she has for the stage and her family. Toya is a woman who grew up in a household that was anything but stable. Her mother is still roaming the streets to this day as an addict. You see in Toya her strong desire to have a stable home life and a husband by her side. In my opinion the fact that she is still close with her ex husband, Lil Wayne's, mother says a great deal about her character and her commitment to family. His mom seemed to genuinely care for Toya so it was sad to see her own mother mixed up in her own twisted escapades. Her mother is clearlytoo distracted to see the daughter she continues to hurt and the granddaughter whose early years are going by too quickly. I hope the show continues on this path and that the ladies come to a place of peace where they can recognize their value and find a measure of fulfillment that is clearly missing in their lives. Side note- Hawthorne with Jada Pinket was good too. When does the "Food Networks Next Star" show air? I always have to catch it on Sunday at 12am but it must come on before midnight....right? Did you watch? What did you think of the show? What else are you watching this summer?